There are many things that contribute to the proper operation of a dryer, the venting is one of the most critical. Below we describe a dryer's functions and how its venting plays a crucial part. One of the most important functions of a dryer is the elimination of moisture recovered during the heating of damp clothing. A typical 12-pound load of laundry can weigh as much as 20-pounds when first removed from a washer. The extra 8-pounds is water. That recovered moisture is held as humidity in the warm air produced by the dryer and is normally expelled to the outdoors through the dryer's vent. If this air can not be adequately vented, poor drying will result. If restricted, this moisture can also condense into pools of water inside the dryer venting, possibly leaking out. Moisture accumulation inside the dryer ducting is often a sign of inadequate venting which should be looked into. The heat is another important function of a dryer. Many current dryer models have 'one time', non-resettable, thermal fuse or safety. These safety devices will open should the dryer overheat due to improperly installed venting or it becomes restricted. Once this happens, the dryer will no longer heat at all and will require the failed part to be replaced to correct the condition. On some dryer designs (usually electric) failure of a thermal fuse will totally stop dryer operation altogether. On older models without one of these thermal safeties, poor venting can cause the dryer to cycle on its safety thermostat instead of its temperature control thermostat. This can cause overheating or under-heating, contributing to poor drying and possibly retarding the movement of the timer on automatic cycles. Poor or obstructed venting can also cause the dryer's external cabinet and/or cabinet top or control area to get hotter than usual. Without proper air flow through the dryer the thermostats may not cycle the heater to maintain proper temperature. The heat created by the heater has to go somewhere, that is usually to the cabinet. This is a sign of a very dangerous condition! Operation of the appliance should be discontinued (and possibly even unplugged!) until it can be corrected. The maximum length a dryer vent can be before problems arise or are noticed varies greatly between brands and models (as highlighted below). The vent material and the type of outside vent cover being used also contribute to the maximum vent length allowed. The chart below allows for a comparison between different brands to provide some examples. In all cases the longest possible working vent should be made of rigid metal vent material with a large mouth or louvered outdoor hood. 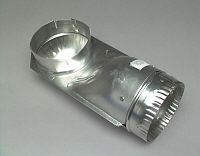 Flexible metal ducting although a bit easier to work with causes reduced air flow due to its corrugated design and will contribute to a lint buildup in the ducting over time. Flexible Nylon ducting is no longer approved in most areas for dryer venting due to the possibility of a fire hazard and has never been approved for use on gas dryers. In the US and Canada, all gas dryers must be vented directly to the outdoors by law! In a properly installed vent, any lint that escapes the dryer's lint filter should be blown right outdoors. Any accumulation which occurs inside a dryer's ducting is usually a sign of poor air flow, especially near the location(s) it occurs. In such cases the venting should be evaluated to locate and correct any deficiencies it may have. inside the dryer where it is a very real fire hazard! 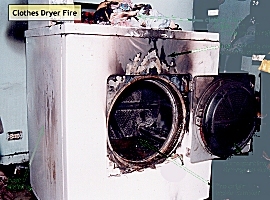 Between 1980-1998 an average of 14,500 fires *per year* are known to have been the result of dryers. Those fires average 13 deaths, 239 injuries and $53.1 million in property damage *per year*. I'm afraid the statistics aren't getting much better and in fact appear to be increasing. 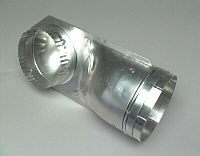 The vent should be as short and as straight and with as few elbows as possible. The more bends and turns, the greater the reduction in air flow there is and more areas where lint can accumulate. 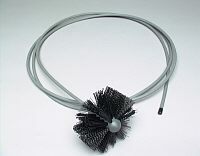 More bends will also hamper vent cleaning which should be performed yearly if not seasonally. 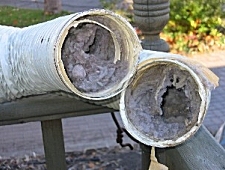 It is sometimes possible to tell if a dryer's vent is the cause of poor drying by totally removing the vent line from the dryer and doing a load. If drying improves, you can be sure the vent is (at least part of) the problem. When attaching multiple sections of vent pipe together, don't use sheet metal screws, use metal foil tape instead. Any protuberances into the vent will cause obstructions where lint can accumulate eventually leading to a restriction. Those protuberances will also make the inevitable cleaning much more difficult. While PVC tubing looks like it would be ideal for dryer venting being rigid and perfectly smooth, numerous technicians report that some sort of static effect seems to take place during use which causes lint to adhere to it, eventually leading to blockages. It may be best to avoid this material for this application if you can use rigid metal ducting instead. Allows for only 2�" clearance between dryer and wall. Extends to 18" Elbow turns 90� within 4�" of wall. Female to male connections for use on dryer vent outlet. Elbow turns 90� within 4�" of wall. 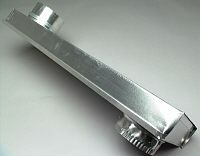 Male to female connections for use on wall vent duct. Available in 10 and 20 foot lengths. The chart below shows the manufacturer recommendations** for maximum vent length under various conditions. The recommendations can change from model to model even on the same brand's products so consult the owner's manual or installation instructions for your specific model. Vent length for vertical installations should likely be *considerably* less than the maximum lengths quoted which are geared to regular horizontal vent installations. Metal A 44 ft. 34 ft. 26 ft. 20 ft. 14 ft.
B 34 ft. 26 ft. 20 ft. 14 ft. 8 ft.
Metal A 60 ft. 52 ft. 44 ft. 32 ft. 28 ft.
B 48 ft. 40 ft. 32 ft. 24 ft. 16 ft.
Metal A 90 ft. 60 ft. 45 ft. 35 ft. 25 ft.
B 60 ft. 45 ft. 35 ft. 25 ft. 15 ft.
Metal A 55 ft. 40 ft. 30 ft. 20 ft. 15 ft.
B 45 ft. 30 ft. 20 ft. 15 ft. 10 ft.
Metal A 60ft. 52 ft. 44 ft. 32 ft. 28 ft.
B 48 ft. 40 ft. 32 ft. 24 ft. 16.ft. Metal A 150 ft. 135 ft. 125 ft. 115 ft. 105 ft.
B 125 ft. 115 ft. 105 ft. 95 ft. 85 ft.
Metal A 65 ft. 54 ft. 44 ft. 36 ft. 28 ft.
B 59 ft. 48 ft. 38 ft. 30 ft. 22 ft.
Metal A 36 ft. 32 ft. 28 ft. 25 ft. 23 ft.
B 28 ft. 24 ft. 20 ft. 17 ft. 15 ft.
Metal A 64 ft. 54 ft. 44 ft. 35 ft. 27 ft.
B 58 ft. 48 ft. 38 ft. 29 ft. 21 ft.
Metal A 36 ft. 31 ft. 27 ft. 25 ft. 23 ft.
B 28 ft. 23 ft. 19 ft. 17 ft. 15 ft.
** Chart data compiled from product owner's and installation manuals. According to Frigidaire (most other makes are likely similar), dryer vent back pressure "MUST NOT exceed 0.75 inches of water column" as tested with an inclined manometer. If the vent system back pressure is less than 0.75 inches of water column, the vent system is acceptable. (Amana recommends 0.60 inches of water column or less for some of their dryer models.) If a manometer reading is higher, the system is too restrictive and the installation is unacceptable. I do not know any dryer manufacturer that recommends venting a dryer through the roof. They do not even provide any vent length data for such an installation. Because the weight of the moist dryer air is much heavier than ambient air, I would think the maximum vent length would be less than 1/2 or 1/4 of the acceptable length of a horizontal vent run. If you have no choice except to vent through the roof, purchasing a 'extended vent' dryer (if available) might help but still keep the total vent length *well* reduced of the manufacturer's recommendations. Alternately, an additional dryer vent booster fan (see below) might help to allow the dryer to function adequately in such an installation. If you have absolutely no choice in running an extended length vent on your dryer, you might consider adding a booster fan. The Fantech model DBF110 (pictured) is specially designed to be used with dryers and includes an automatic pressure switch which activates the unit whenever the dryer is running. An integral delay-on-break timer in the switch will cycle the fan on for intervals of 10 minutes for energy efficiency. This will continue until the dryer has stopped and the timer delay period has lapsed. Graphics Copyright RepairClinic or Appliance411.com, All Rights Reserved. Reprinted with permission.